Many users have asked about inactive time — what it means, how to interpret it, or even whether we should track inactive minutes or not. This article intends to answer these questions. As you might already know, Worksnaps tracks time by 10-minute intervals. Each hour has six 10-minute intervals. During each 10-minute interval, Worksnaps client records the mouse and keyboard volume. If there is mouse or keyboard activity, that means the user is working on the computer therefore the 10-minute interval is accounted as work time. On the other hand, if there is no mouse or keyboard activity recorded, the 10-minute interval is categorized as Inactive. Inactive minutes are not accounted in the reports or billing. They are there for information only (we will explain it later). In this example illustrated by the picture, the user has logged 150 minutes for the day, including 90 minutes of active time and 60 minutes of inactive time. The total work time of the day is 90 minutes, which does not include the 60 minutes of inactive time. You can easily identify the inactive time by the grayed-out screenshots also the activity meter has no green bar. 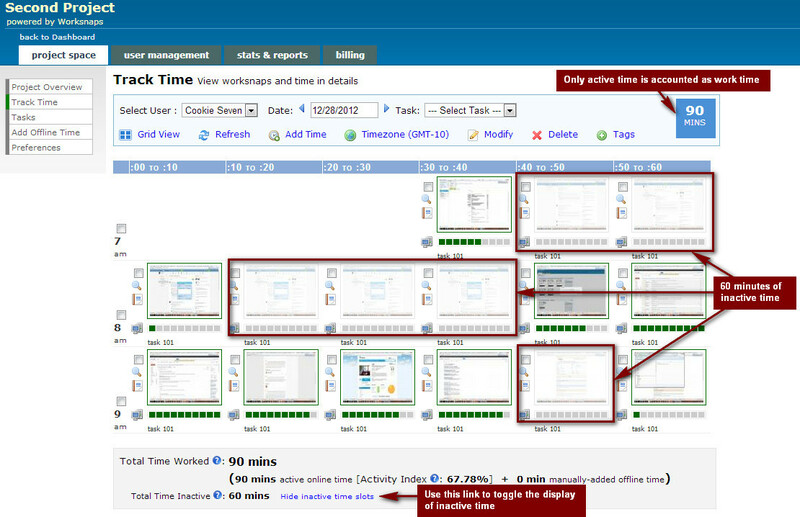 You can toggle the display of inactive minutes by using the link at the bottom of the page. First of all, you can rest assured that the inactive time is not accounted as work time and not being considered in reporting or invoicing. Let’s get this out of the way. Also, if you don’t like to see inactive minutes, you don’t need to do anything because it won’t show up by default. was actually idle. Therefore a potential dispute can be avoided. Also, a lot of times, showing the inactive time makes the screenshot view more contiguous, thus you can more easily see the timeline of a user’s work throughout a day. This is part of our Tips and Tricks thread in the Product Blog. We will be posting more articles like this to address some common questions and give advises on how to better use the product. ← 1 Million Hours Tracked!